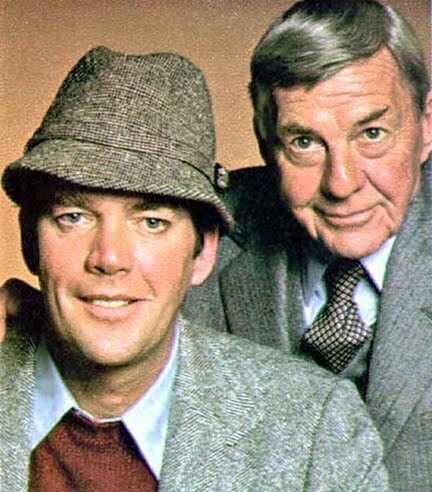 Mystery writer Ellery Queen (left, Jim Hutton) and his father, New York City Police Inspector Richard Queen (right, David Wayne). If you're anything like me, you love watching mystery stories on TV. Lately, I've been watching Murder, She Wrote episodes in the mornings on TVLand. When I heard that a friend was watching Ellery Queen episodes on Hulu--I thought I'd share the classic New Year's Eve episode from 1975 entitled "The Adventure of Auld Lang Syne." This short-lived TV series is also available for viewing on DVD. At a prestigious New Year’s Eve party ushering in 1947 at the Astor Hotel in Times Square, a wealthy businessman Marcus Halliday is found murdered in a telephone booth. Inspector Queen is already at the party and insists that his son Ellery come at once to help with the investigation. Though the story takes place in 1946/47, when was the last time you saw a telephone booth? Above, Inspector Queen is about to open the door to the booth and discover Mr. Halliday's corpse. Turns out the angry Mr. Halliday had just informed his six party guests that he was disinheriting them all from his will. While waiting for his son to arrive, Inspector Queen questions Halliday’s guests: Lady Frawley who accompanies Lewis Halliday, Marcus’ ungrateful son. There is also Miss Zelman the secretary and her sheepish boyfriend Howard Pratt, Paul Quincy the lazy nephew, and Don Becker--Halliday’s new business partner he thinks is corrupt. Cast photo I found from this episode. Left to right, top row: Guy Lombardo, David Wayne, Barbara Rush as Miss Zelman, Ray Walston as Howard Pratt, David Doyle as Don Becker, and Thayer David who plays Marcus Halliday. 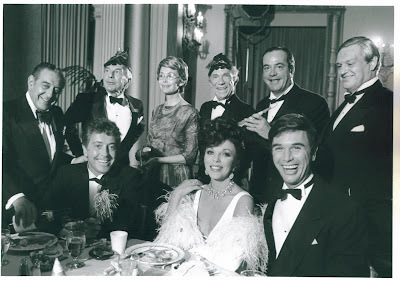 Bottom row, left to right: Farley Granger as the nephew Paul Quincy, Joan Collins as Lay Frawley, and Charles Robinson as Halliday's son Lewis. When the Inspector found Halliday dead in the phone booth, Joe Kemmelman, a Manhattan undertaker was still on the telephone line. An apparent stranger to this group of people, Kemmelman is brought to the Astor Hotel by the police to find out his connection to the murder. (Kemmelman is played by George Wyner). 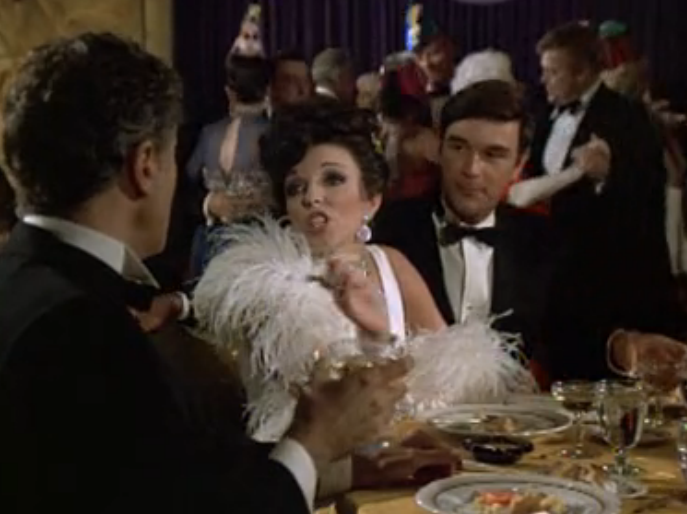 Delicious as ever, Joan Collins plays--no surprise--the slutty, gold-digging social climber Lady Daisy Frawley. Though it takes Ellery all night to hunt down a cab and travel to busy Times Square to reach the party, he quickly solves the case without asking any further questions from the party guests. However, Ellery knows the identity of the murderer from a bit of obsolete knowledge that few TV viewers would recognize today. 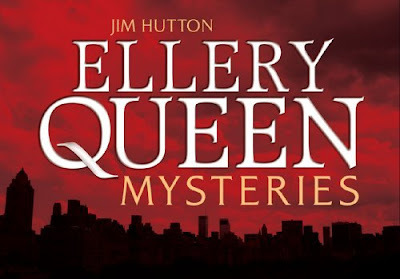 The detective work is explained so you can appreciate Queen's reasoning skills but I fear few contemporary viewers can solve the case for themselves--just as Ellery asks us to do, directly addressing the viewers by breaking the fourth wall and facing the camera. 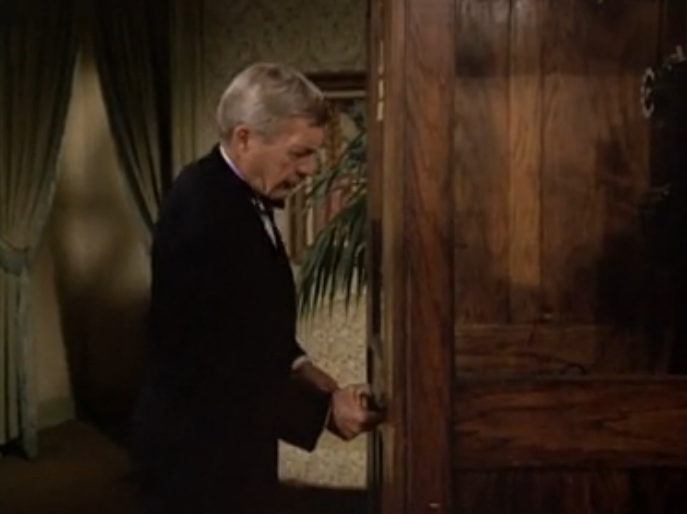 I don't want to spoil the murder mystery by explaining the obsolete references--however this episode is still entertaining and certainly worth watching. 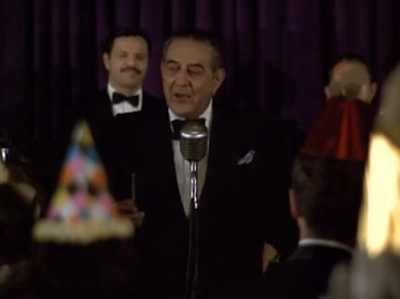 The band leader known for his New Year's Eve concerts, the real Guy Lombardo plays himself. It's certainly worth watching to see Joan Collins playing a role she's played again and again, one she knows by heart and we love her for embracing. Another highlight of this episode is the orchestra leader Guy Lombardo who hosted popular Times Square New Year’s Eve parties for decades, first on the radio and then on TV, plays himself in this holiday episode. Do you like watching mystery stories on TV? What is your favorite series--and does it have a holiday episode?